Trapping household dust, smoke and pollen particles in the air, the Vax range of Air Purifiers will help to refresh and revive your home. Suitable for rooms up to 10m2. 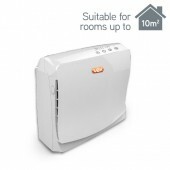 The Vax Air Purifier is ideal for creating a healthier environment in your home, perfect for smaller rooms up to 10m2, featuring a built in HEPA media filter. The Air Purifier effectively traps dust, smoke and pollen particles, featuring 3 variable speed setting and purification levels so you can adjust to suit your needs, as well as being ultra quiet when in use, so is great to use all over the home. Suitable for rooms up to 20m2. The Vax Air Purifier is ideal for creating a healthier environment in your home, perfect for smaller rooms up to 20m2, featuring a built in HEPA media filter. The Air Purifier effectively traps dust, smoke and pollen particles, featuring 3 variable speed setting and purification levels so you can adjust to suit your needs, as well as being ultra quiet when in use, so is great to use all over the home. Suitable for rooms up to 28m2. 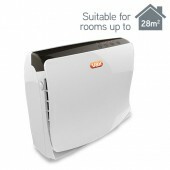 The Vax Air Purifier is ideal for creating a healthier environment in your home, perfect for smaller rooms up to 28m2., featuring a built in HEPA media filter. The Air Purifier effectively traps dust, smoke and pollen particles, featuring 3 variable speed setting and purification levels so you can adjust to suit your needs, as well as being ultra quiet when in use, so is great to use all over the home.